System: Released for the Sega Genesis in 1991. Developed by Johnson-Voorsanger Productions and Published by Sega. Toejam and Earl, two hip aliens ? Toejam with a bifurcated head, three legs, and a gold-chain necklace, Earl with sunglasses and a slight weight problem ? enjoy tooling the galaxy, blasting extremely funky tunes, and having an all-around funky time, in their righteous rapmaster rocketship. But when Earl takes his turn in the driver\'s seat, their ship collides with a meteor and falls like Bush\'s approval rating to the quiet planet below. Little do they know that the planet is not as subdued as it seems. Without a means of transportation - and no Hostel in sight - ToeJam and Earl find themselves trapped in the most wacked-out, insane, un-hip place in the galaxy: planet Earth. Never let earl drive. Thus begins the long trek through Earth\'s 25 levels to rebuilding their ship and getting back to the most important thing in life: chillin\' and listening to sick tunes. So Earth is like this: Earth is made out of levels...no, tiers; Earth is made out of island tiers that float inconspicuously among the stars. Toejam and his funky bro big Earl have to traverse to find the pieces of their righteous rapmaster rocketship by using presents, avoiding earthlings, and trying not to drown. But the EARTHLINGS make it difficult. Li\'l devils, killer bees, women pushing a child in shopping cart, giant hamster in a bubble, insane doctor, Cupid, haunted mailbox, phantom ice cream truck, and more, all make the journey through Earth a living hell... on Earth ? in the most literal meaning of Hell. It\'s very Dante-inspired. The only difference, is that the tiers get more hellish as you go up not down. But that\'s just splitting hairs. If you fall off th edge of the islands, you fall to the next lowest level. Transportation from tier to tier was in the form of an elevator which played funky elevator beats. Oftentimes, if both aliens were together, ToeJam would make lude comments at Earl\'s expense. Although the two were very close, they didn\'t miss slinging insults to pass the time. \"Get a life, Earl\" was one of the more common lines. To help ToeJam and Earl combat the Earthlings, they must get powerups in the form of presents. Sometimes these presents can be bought at mailboxes, sometimes spooked out of rocket-Santa, but mostly they\'re discovered on the ground, in the most unlikely place ? but easily the most convenient. Since most of the floating levels are not contiguous, these presents come in very handy as they can contain rocket shoes, super high-tops, Icarus wings, doorway, un-fall, root beer, tomatoes, telephone, decoy, or any other of the many presents ? all which are random at the beginning of each game. When the Sega Genesis came out in 1989, the major players were Altered Beast, Golden Axe, and, of course, Sonic the Hedgehog, but two years later that all changed as the Sega Genesis/Mega Drive received another triple-A exclusive title (ignoring \"Sonic 2\") in the form of ToeJam and Earl. 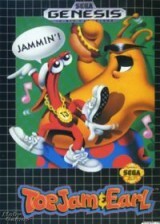 ToeJam and Earl coexisted with many of the other Genesis titles until the sequel \"Panic on Funkotron\" was made; because \"Panic on Funkotron\" went the 2d platformer route instead of staying 2d isometric adventure, many fans of the dynamic alien duo felt betrayed, even though the sequel was an excellent 2d platformer. TJ&E was influential mainly because of the music-centric attitude. It housed a superb soundtrack composed by John Baker (whose composition \"JamesBrownInSpace\" still haunts me to this day). Baker\'s composition is funky, hip (as they used to say), and really, really catchy. But there was more to ToeJam and his big bro Earl than just music. Gameplay never took a hit during the strange marriage of music and style. Music and style, as we would learn later with Jet Set Radio (Jet Grind Radio in the US) on Dreamcast, go together like peanut butter and jelly. The game was slower than the likes of Sonic. But among many games of the early 90s, Sonic was the exception. It was allowed to \"pace itself,\" which proved the atmosphere of games could be more casual, laid back, and still enjoyable. It was, in many ways, the very opposite to the frenetic jumping and running of Sonic. And in this, it distinguished itself entirely. But it also brought jump-in-and play coop mechanics to the table. Though Contra and Golden Axe had done it too, there were few games in which cooperation meant more than it did in ToeJam and Earl. ToeJam and Earl like to hang together, but that never means they have to be in the same place at the same time. When ToeJam and Earl split up ? get too far apart ? the screen morphs into a horizontal split-screen, allowing adventuring to continue unhindered by your partner. In fact, there was no limit to how far one could go without his or her partner, the game allows player one adventure in level 5 while player two journeys to the reaches of the fabled Level O. ToeJam and Earl could also perform a high-five, which equalized the life between the two aliens. And the special present (only in coop) called \"Togetherness\" teleported the recipient alien to his distant friend. On top of this ambitious feat, the game also features \"randomized\" levels, so things never get stale. And since the presents are randomized (or could be randomized by opening the present called \"randomizer\") ToeJam and Earl was able to stay very fresh long past its shelf life. The game was adventure based, and while you didn\'t upgrade your character, you did \"level up\" as you progressed. From the lowly \"Weiner\" to \"Dufus\" then \"Poindexter\" and to the likes of \"Funkmaster.\" Every few levels or so, you\'d gain a life. There is also a present that allowed the aliens to level up faster. Leveling up was important, but not detrimental, as the higher level, the larger the life bar, thereby extending the life of either ToeJam or Earl. The two aliens were slightly different in gameplay. Toejam, the red, three legged alien, was able to move faster, while Earl, the obese orange alien, had slightly more life. Graphically, what can one say about a game that\'s fourteen years old. The animations are a little jumpy, and the textures on the ground are somewhat repetitive. But the gameplay, the wonderful coop gameplay, is still as fresh as any game of this generation. I think of the tightly executed \"Cloning Clyde\" on Xbox Live Arcade in comparison to ToeJam and Earl, even though Clyde is a 3d-rail platformer. But that is only touching the tip of the iceberg that is TJ&E. This might sound cheesy, but the game actually does promote a sense of brotherhood between the controllers, since it\'s not a violent game by any means (you use tomatoes to \"pop\" the earthlings) and the game doesn\'t swear (worst thing is a text bubbled \"Shut UP!\" from the woman pushing her baby in a shopping cart). It actually promotes a sense of utility when both aliens are together, but also independence when they\'re apart. Cool stuff. No enough critical interpretation for you? ToeJam and Earl game also pokes fun at \"civilized\" Earth culture by putting the controller in the place of the other. (How\'s that for a critical interpretation). Here the player can criticize, without fear of rebuke, the insanity of Earth culture ? that of the late 80s anyway. The music, one of my most memorable aspects of the game, still is amazing. The soundtrack by Baker is truly one for the ages, not to be simply reproduced or imitated in any game, by anyone. It only takes a moment to know the soundtrack from ToeJam and Earl. People still love the Music to ToeJam and Earl: there are remixes of JamesBrownInSpace all over the place. This one is by DJPretzel. Just a note: this isn\'t the in-game music. ToeJam and Earl is a tough one to find, simply because it was one of the best games of its day. Still, that doesn\'t keep people from selling it on eBay for as much as $50 or as little as $15. You might also be able to find a rom on the net somewhere, but I\'d be careful since most roms have been tracked down and forcibly removed by the creators of the games.